Widely recognized as the matriarch of the Charleston Renaissance, Elizabeth O'Neill Verner created images of her native city that would, over time, come to be viewed as the quintessential aesthetic definition of picturesque Charleston and the South Carolina Lowcountry. "From my earliest days, the beauty of Charleston has been a conscious blessing," Verner acknowledged. "I owe my native city incalculably much." The daughter of a rice broker, Verner began drawing as a child. She studied locally with Alice Ravenel Huger Smith before spending two years under Thomas Anshutz's tutelage at the Pennsylvania Academy of the Fine Arts. Returning to her native city in 1903, she married E. Pettigrew Verner and raised two children. 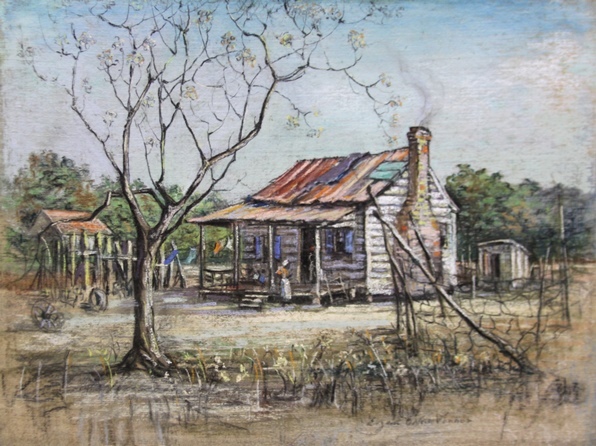 During this period, she studied informally, painting scenes of Charleston in her spare time and studying Japanese printing techniques. In 1923, she took up etching and, two years later, established her own studio. Verner was a frequent exhibitor, and her work was acquired by such notable institutions as the Metropolitan Museum of Art, Museum of Fine Arts Boston, and others. The 1930s marked the high point in Verner's career as an etcher and the onset of her interest in pastels. During a 1937 visit to Japan, Verner studied ink painting with a Japanese master and explored the idea of applying pastel crayons to raw silk while it was still wet, which allowed her to work in modulated layers of color. Once the silk had dried, she added the final touches. She called the process Vernercolor. Pastel became Verner's favored medium as it ideally combined the elements of drawing and painting. A founding member of the Charleston Etchers Club, Verner was a respected leader in the city's art community. Along with Alice Smith, Anna Heyward Taylor, and Alfred Hutty, she played a pivotal role in Charleston's dramatic mid-century cultural renewal. Her works showcased Charleston's natural beauty and charm, including: live oaks draped in moss; tall cypress trees in abandoned rice preserves; colorful flower women; and the streets and alleyways of the city, a favorite motif. An extremely articulate artist, Verner taught, lectured, and authored four books illustrated with her etchings. She also illustrated DuBose Heyward's Porgy and Bess.